Welcome Readers – Happy Summer! Hi readers! I’m devoting this segment to some questions that I think a lot of us can relate to and some terrific garden tips I have received. 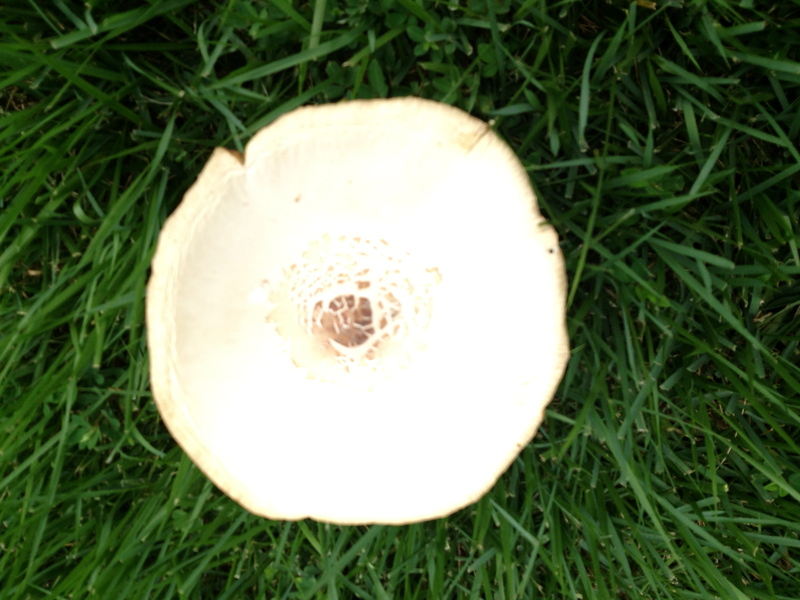 Let’s get rid of the mushrooms for good…..
First up: Getting rid of those nagging little (and sometimes BIG) mushrooms that crop up in the yard after a rain. Wearing gloves (because some of them can be poisonous! ), remove the mushroom cap and discard. Then, with a pointy trowel or weeder, dig out the little stump and roots completely. Lastly, sprinkle some powdered or granulated lime where the mushrooms appear. This will help to make the soil more alkaline and banish the mushrooms for good. This has always worked well for me. Renewing your Ivy is easy as a few well placed snips! Next up: I had a friend with a patch of Ivy which had lost all of its leaves and was just a patch of bare stems and not so pretty anymore. This can happen for lots of reasons — someone walking on the ground cover, doggies doing their business, or like in my friend’s case, a tree had fallen on it. There is a really easy fix for this! 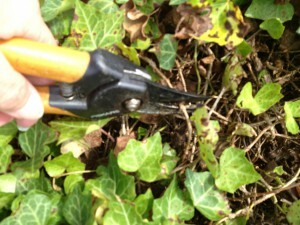 Simply take your snippers and cut the stems here and there in the bare areas. That’s it – the Ivy will sprout new leaves quickly and will fill back out in a week or two with lots of fresh new leaves. This works on most of the other “sprawling” types of ground cover, like periwinkle and pachysandra too. Be sure to give it good watering if you know it to be a (ahem!) “doggie spot” to neutralize the remains. ‘Nuff said on that, but this brings me to a related tip. If you are a dog owner and have those bright green patches in your grass, I have a tasty way of making sure those spots don’t happen anymore. Give your dog a few ounces of tomato juice a couple of times a week (most dogs LOVE it! ), it will change the acidity of their urine so as not to create a spot. So easy! 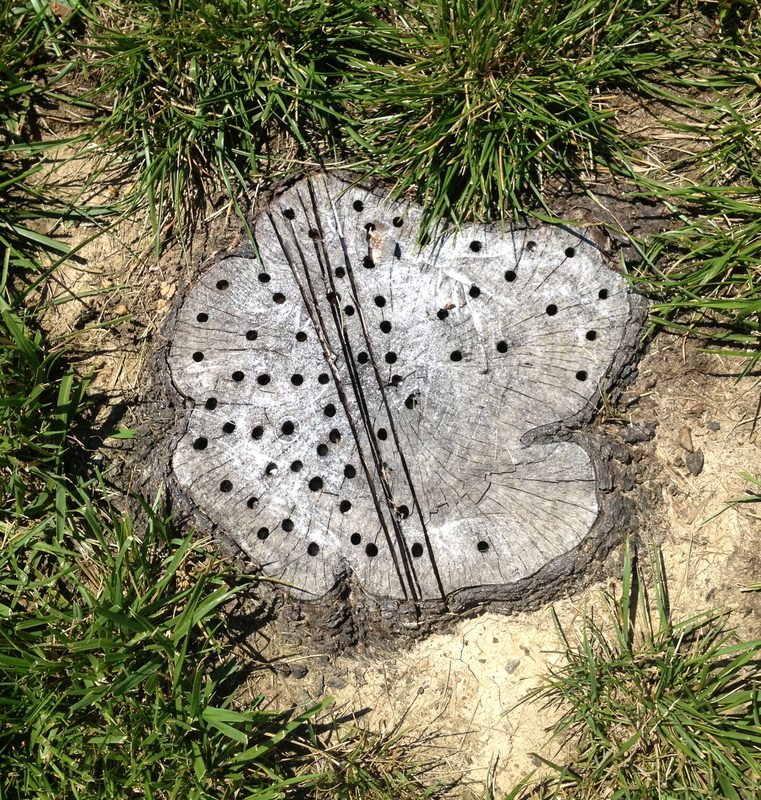 To get rid of ugly stumps- drill holes and fill them with epsom salts! As you might remember from a previous blog, I have had several trees that were destroyed in recent storms, leaving unsightly stumps in the front lawn. A couple of weeks ago a friend sent me an email that had a stump rotting remedy which I am going to try (Yay!- and thank you so much!). Drill holes in the stump then fill them with epsom salt. 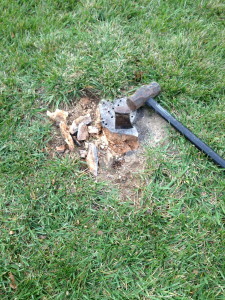 In about a month it rots the stump making removal easy. I will report back on the success of this tip, but several people have said it works well. This brings me to my last little tip for this segment. 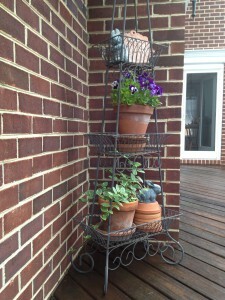 A friend just posted a terrific way to keep the bugs away from patios/decks, and said it worked great. Take limes or tangerines, and poke some holes in them with an icepick, and fill the holes with cloves. (Similar to the pomanders many of us make at Christmastime!) Place them in a bowl on your outdoor table, and enjoy your bug free patio. Lasts for a couple of weeks at least! Don’t forget to refresh your topiaries, and other potted plants with some fresh soil and slow release fertilizer. I would like to thank Michaelanne, Terri and Laura for their questions and tips. 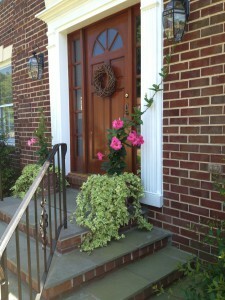 I hope you are enjoying this Spring to Summer transition in your yard. It seems there are always things to be done around mine. 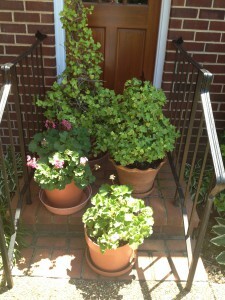 I have just finished replacing my Springtime Pansies with Vinca and Geraniums for the hotter Summer days ahead. I have repotted the Ivy topiaries with fresh soil. 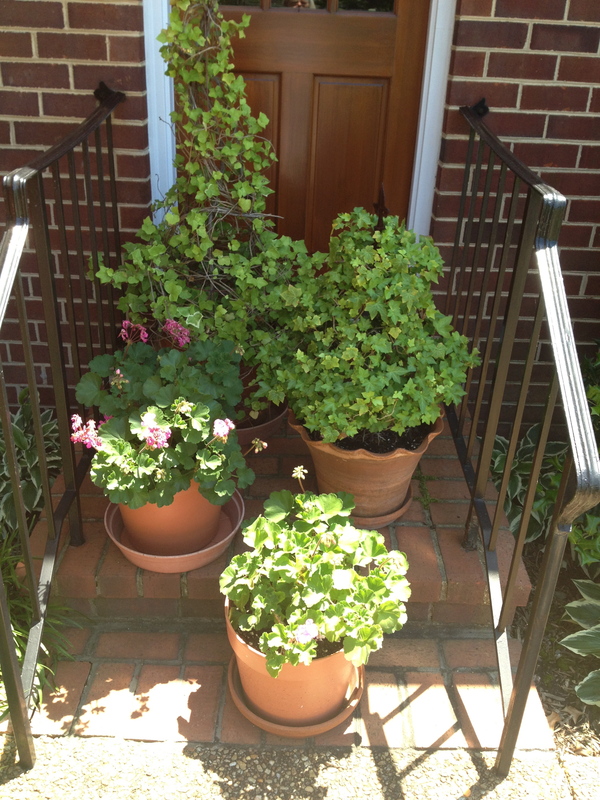 (I love to use them along the front walk.) A gentle reminder for those of you with Azaleas, Rhododendron, Hollies, Junipers, or other acid loving plants, that this is the time to feed them. 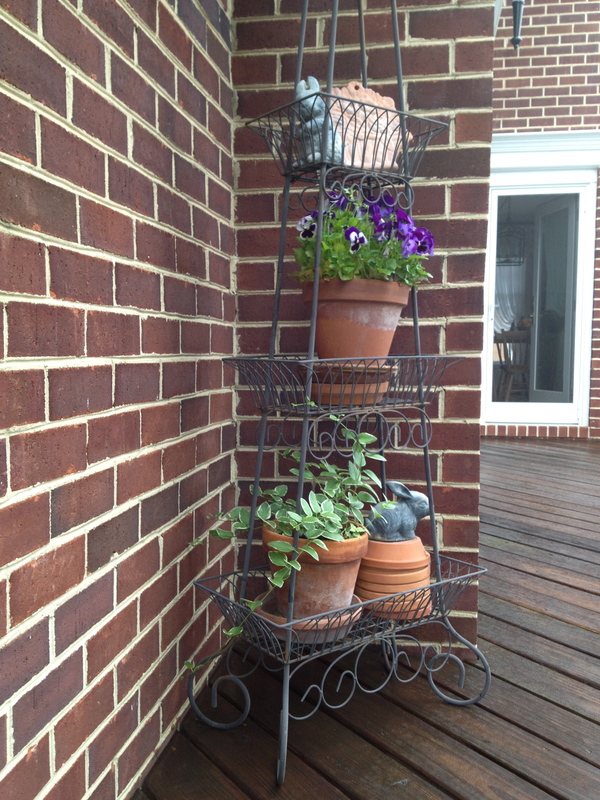 Let me know what you are planning for your gardens this year, I always love to hear! So long for now- next time a segment on refreshing a deck! Update on the stump– Epsom salts works! It is now November, and the stump had softened up to the point where it was easily chipped away. Now I will fill in with some soil and sod. Thank you Terri for the tip! 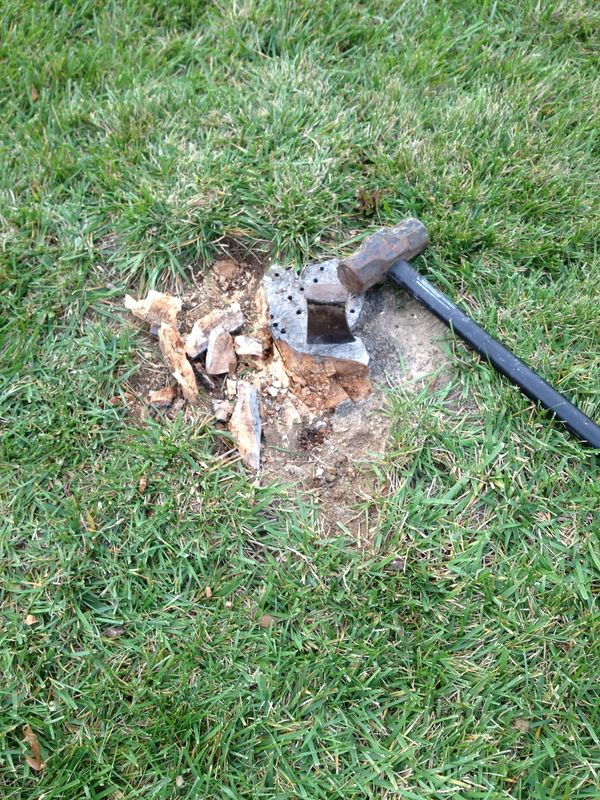 After a few months of the epsom salt treatment this stump was chipped away in about a half an hour.